Wolverhampton Wanderers goalkeeper Carl Ikeme has signed for Leicester City on a one-month loan deal. The 24-year-old will provide cover for Chris Weale, who was forced off during the Foxes' 3-0 defeat at Burnley on Saturday with a shoulder injury. Ikeme is expected to make his debut for Leicester against Reading on Saturday. The Foxes played Conrad Logan in goal in their 2-1 Carling Cup win against Leeds and their other option is young Hungarian keeper Robert Ambrusics. 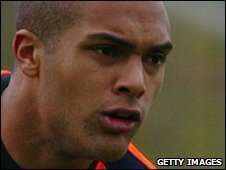 Ikeme has also had spells on loan at Charlton Athletic, Sheffield United and QPR.